Rachel's table runner is done! Her first quilt project is complete and beautiful! 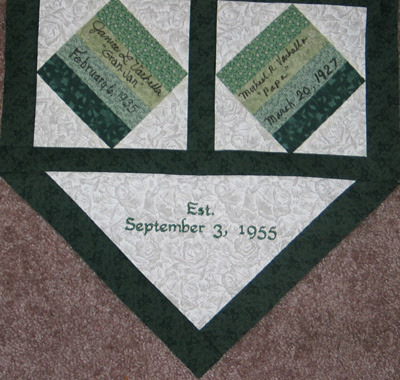 Thursday and Friday of last week we got the quilt top basted and she quilted it. Yesterday and today we figured out how to do the binding completely by machine (something I hadn't attempted yet) and got the table runner finished. I realize that these pictures don't look all that different than the last ones I posted, but they are! I was impressed with her mitered corners in the binding, especially since I didn't have any personal experience with which to advise her. 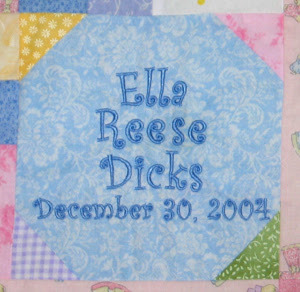 As she was doing a tiny bit of hand stitching to finish them off, she was having periodic contractions. Now she can go into labor with this project behind her -- here's praying it's soon! I asked Carla what we should do. We decided to see if I could find more online (no luck thus far), as well as what other fabrics from within the quilt JoAnns had. This morning I went by and narrowed it down to two fabrics and decided to double check with Carla before making the purchase. 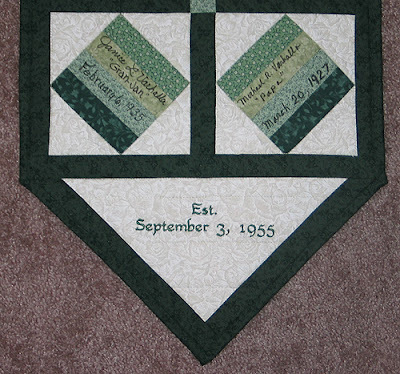 I saw her a bit later, and as we were looking at the quilt with her husband, she gasped and said, "It's S! Reese is spelled with an S!" I had embroidered it wrong! I went back and checked; sure enough, Carla's email said Reese, but at every stage of my design process, I had Reece. Five minutes later, Ella Reese! 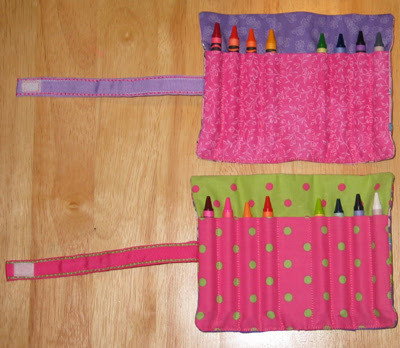 These crayon rolls are for a customer. After my first batch I finalized exactly how to construct the personalized velcro closure. I asked Kathy to create a miniature applique design for me so that I could include the tack down of the velcro in my embroidery design for the name on the ribbon. 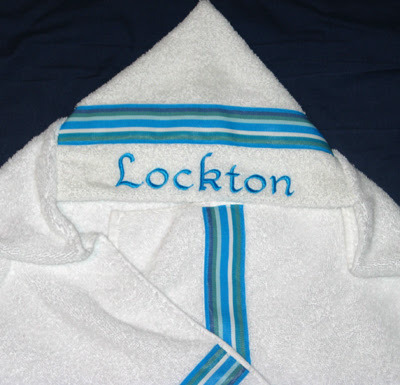 (I doubt that makes since to those of you who don't have an embroidery machine, but the end result is a more efficient and precise way of doing it!) 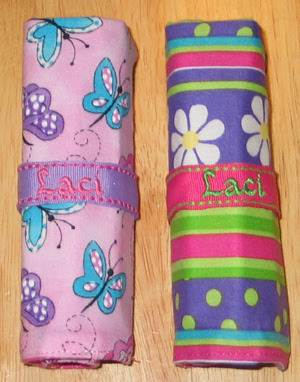 I was pleased with the results, and I hope Laci and her mom are, too! Mid-July a friend from church, Rachel, asked if I'd be willing to help her make a signature quilt for her grandparents' upcoming anniversary. We used a google image search to find inspiration, and then used my Electric Quilt program to draft a pattern. I sent her on her way to shop for fabric, and then we've spent several afternoons together working on it. It's been fun to walk her through the whole process, and she has done a FABULOUS job so far. I've shown her how to use all the tools, but she's done virtually all the cutting and sewing herself. 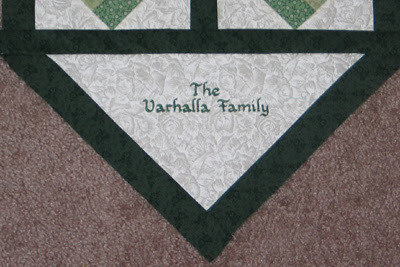 After doing a bit of embroidery work for her today, we've got the top pieced, and I just had to post pictures. 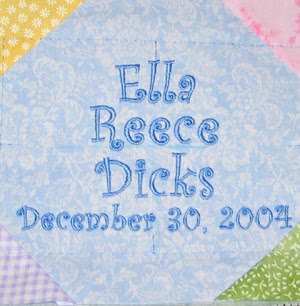 This will be a table runner for her grandparents. It includes the signatures/birthdates of her grandparents, who didn't know what they were signing :) as well as parents, aunts/uncles, cousins and the next generation. There is one empty block saved for the newest member of the family who is due any day now... Oh, did I forget to mention that Rachel started this at 8 months pregnant?!? Assuming she's not in labor, we plan to baste it and start quilting tomorrow. * use more fabric in the skirt. I was being cheap and didn't buy 45" of the fabric I needed to make it gather like it should. I realized after the fact that I could have pieced the skirt since the pattern repeated on the yardage... oh well. * Do a better job tacking the elastic down on the skirt. I had never sewn elastic to fabric like this before (remember I'm new to garment construction) and I didn't space it out very well. So one half was much more gathered than the other. * Use less elastic. By the time I got it stitched to the fabric and then to the shirt, it wasn't tight enough anymore. * Don't use a shirt with 5% spandex. Not only did the elastic stretch and not return to it's original length, the edge of the shirt stretched as I added the skirt to it. To try to fix all of that, I added the ribbon around the waist with a tie in the back. That helped me make it fit her waist better. Oh, and the beautiful hair bow is compliments of Ms. Valerie! While I was in IL, my mother-in-law gave me several yards of chalkboard fabric. 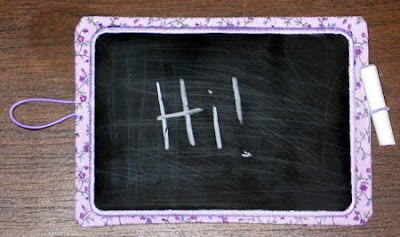 This is the coolest stuff -- it's vinyl, but can be written on and erased just like a chalkboard. It turned out ok, but there are some kinks that need to be worked out. * Each ponytail holder needs to be stitched on top of itself instead of side by side (the chalk twists perpendicular to the roll). * The chalkboard fabric was rolled the opposite way on the bolt, so the mat resists being rolled (actually I "folded" it). Only time will tell if the material will flatten out and decide to cooperate. 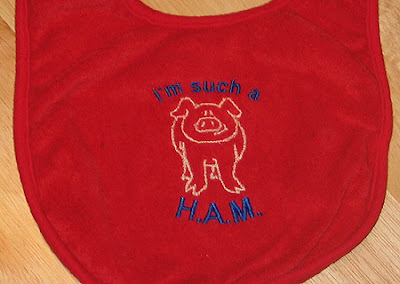 The first is a bib that Misty ordered for Kristen. I purchased a package of blank colored bibs at ToysRUs. 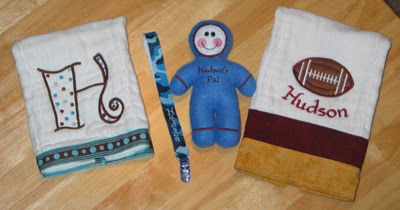 Misty requested a blue bib with brown stitching to match their color theme. The text was added with Embird Alphabet #2. 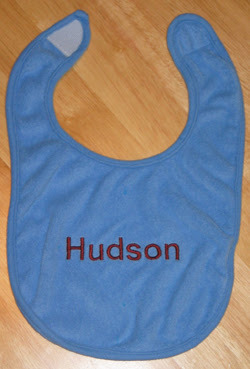 The second bib is one I just had to do for fun... Kristen plans to name him Hudson Allen, so this one uses his initials. 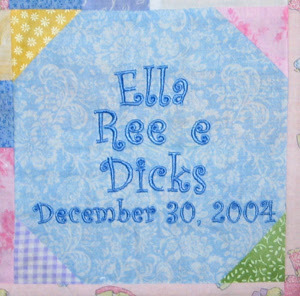 The design was a freebie on Sew Forum, and the text was added with Embird Alphabet #2. Hi! Good news -- my machine is fixed!! I drove it up to a Janome dealer in Moultrie GA who was able to repair it while I browsed downtown. Despite the nervous feeling that I had the whole time I was there, I did enjoy visiting a FANTASTIC quilt shop. It was nice spending an hour and a half looking a fabric and patterns. I have stitched out a couple things this evening, but they are gifts, so I'll post them later. Yesterday was Kristen's baby shower, so now I can post the rest of her gift. :) Thankfully I was determined to finish her gift before leaving for my trip to IL, because when I returned home, my machine decided to stop working! So for those of you who look forward to my nearly daily posting of new embroidery projects... please pray for a rapid (and inexpensive) repair! First up is one of the Snowbabies from The Embroidery Market. 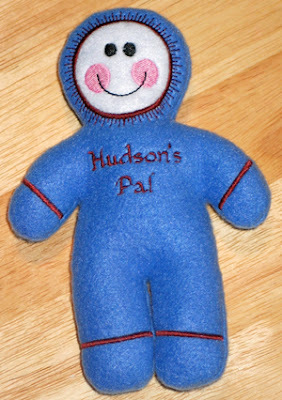 I chose brown and blue because those are the colors of Hudson's nursery. And two burp cloths. The one with "H" and dots has been previously posted. 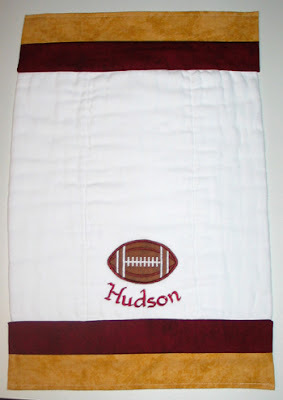 This one has garnet and gold fabric and an applique football from Embroidery Garden (off of a freebie football sucker holder available on her yahoo group). The text for all of these items was added with Embird Alphabet #33. Not pictured is a flannel Rag-Tag blankie, similar to the one Rachel got!